LAUSANNE, Switzerland -- A group of world powers have agreed on some technical specifics and a broad political agreement with Iran that will limit but not destroy its nuclear program. "Today we have taken a decisive step. We have reached solutions on key parameters of a joint comprehensive plan of action," European Union foreign policy chief Federica Mogherini said Thursday. "The political determination, the good will and the hard work of all partners made it possible and let us thank all delegations for their tireless dedication. This is a crucial decision laying the agreed basis for the final text of the joint comprehensive plan of action." Mogherini said said the parties will now work on drafting the text of the comprehensive plan, with a goal completing the work by June 30. The working title is the Joint Comprehensive Plan of Action or the JCPOA. Mogherini said that Iran will retain one enrichment facility at Natanz, and the Fordo nuclear complex would be converted to a nuclear physics, technology and reserach center that will no longer enrich uranium for at least 15 years. The E.U. and U.S. will release all nuclear-related sanctions only once the International Atomic Energy Agency (IAEA) verifies that Iran has complied with the agreement. Iran will reduce approximately two-thirds of its of its installed centrifuges, a reduction from about 19,000 installed today to 6,104. Only 5,060 of them will enrich uranium for 10 years. All excess centrifuges and enrichment infrastructure will be placed in IAEA monitored storage. Iran has also agreed to not build any new facilities for the purpose of enriching uranium for 15 years. Iranian Foreign Minister Javad Zarif, speaking to reporters after the announcement of the framework, said, "None of those measures include closing any of our facilities. The proud people of Iran would never accept that." He also said that Iran expects the U.S. and E.U. sanctions will be ended in a way "so that people will not get into trouble with their legal institutions." "We have stopped a cycle that was not in the interest of anybody," he said. In Washington, President Obama hailed the "historic" agreement as "a good deal" that meets America's core objectives and make the U.S., its allies and the world safer. The historic agreement, if implemented, he said, "will prevent Iran from obtaining a nuclear weapon." A diplomatic source told CBS News that this agreement tackles about 20 percent of the issue and defers decision making on many of the larger implementation concerns until the end of June. That is when the existing interim agreement that has kept Iran's nuclear program frozen during negotiations will expire. CBS News is told that the agreement does include technical elements that will be disclosed in some form in order to allow the U.S. to demonstrate to Congress it can theoretically guarantee a one year breakout time before Iran would be able to build a bomb. That one year breakout time is the benchmark for success that the White House has set for itself. Tehran denies that it has any intention of building an atomic weapon but it is negotiating because it wants sanctions lifted. Iranian negotiators want to be able to disclose what they have gained but are hesitant to release information on the concessions made thus far. Secretary of State John Kerry echoed much of what Mr. Obama said during his remarks at the White House, defending the deal as the best way to stop Iran from gaining a nuclear weapon. "Simply demanding that Iran capitulate makes a nice sound bite, but it is not a policy, it is not a realistic plan," he said. The negotiating group, which includes the U.S., United Kingdom, France, Germany, Russia, China and Iran, had struggled to wrap up the negotiations. They did not announce the framework until two days after the original deadline of March 31. During the course of talks this week CBS News reported that the deal being offered would set limits on Iran's nuclear program for the next 15 years with the most stringent restrictions hitting during the first decade. 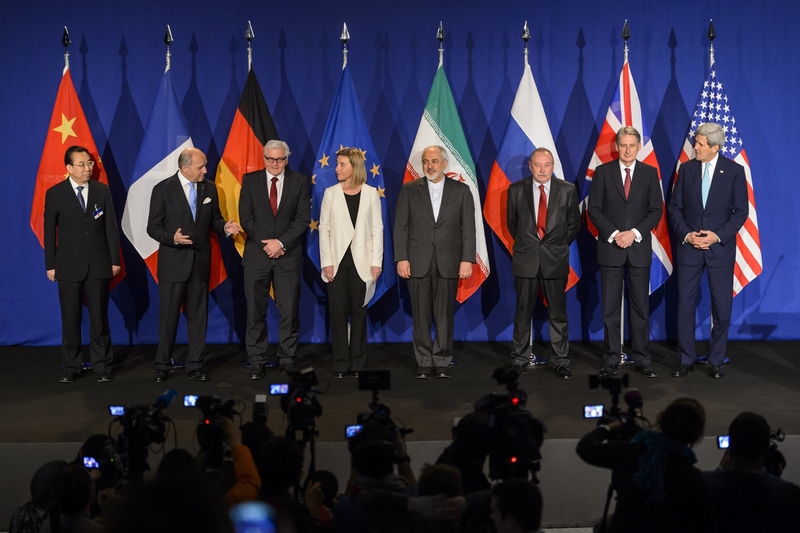 Both Senior US and European officials emphasized that there was disagreement with Iran over what would happen during the final five years of that accord. Specifically at issue was how much nuclear enrichment it would be allowed to carry out and how quickly it could carry out that research and development. The offer included plans to lift financial, economic and oil sanctions on Iran that had been levied by the U.S. and European Union. However, there had been disagreement over how to structure the lifting of the U.N. Security Council sanctions that have cut Iran off from the global markets and made it an international pariah. There were also disputes over how to make Iran's existing atomic stockpile unusable in a warhead. It is not yet clear whether or how many of these issues have been resolved. Within hours, a statement is expected to be made by representatives of the European Union and Iran at the Ecole Polytechnique Federale de Lausanne.